Oceanside High School has a location that many other big public campuses may envy. The 2,500-student school is an easy walk to some of California’s most beautiful beaches and also is close to the big open spaces of the U.S. Marines’ Camp Pendleton base along the Pacific coast. What’s more, the campus is just to the west of the Interstate 5, the main freeway route that puts downtown San Diego only about 40 minutes away. 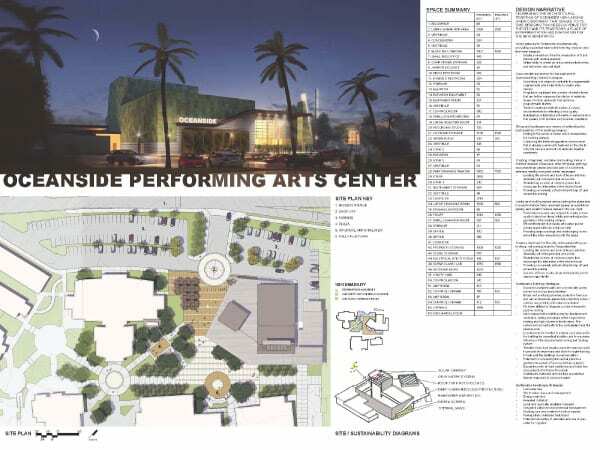 So when education officials in Oceanside decided that the school needed a new performing arts center, they knew they wanted to take advantage of the location and create a landmark that could be seen from the freeway. 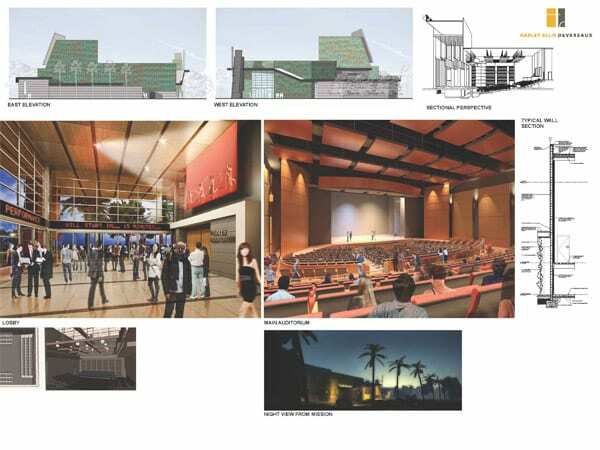 They also wanted a facility that would serve students taking part in drama, music and dance programs, as well as accommodate the wider San Diego County community who could attend professional shows there too. 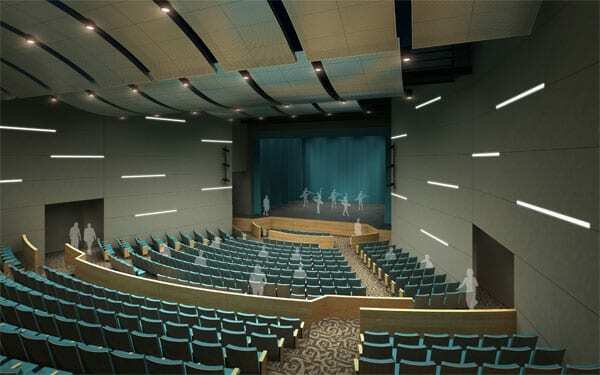 The school district figured that sponsoring an architectural competition for the first time might yield an array of designs to satisfy those demands and solve more practical questions of loading in theatrical scenery and helping students master the skills of digital lighting and sound production. 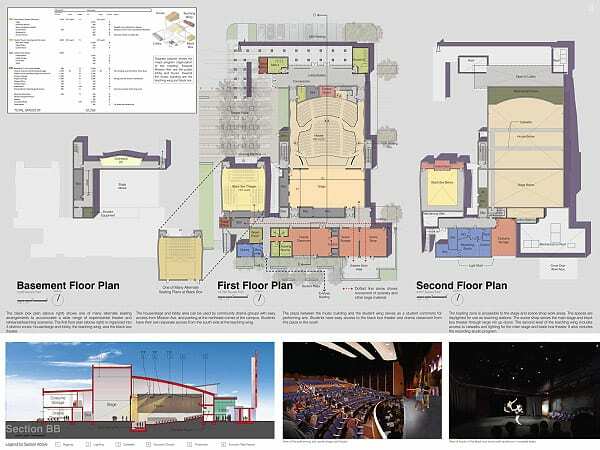 The program for the 20,500-square-foot arts complex included a 500-seat auditorium with a proscenium stage, fly loft, and band pit; a “black box” space that could hold 150 audience members for more experimental performances; and other indoor and outdoor spaces for meetings, galleries and classes. 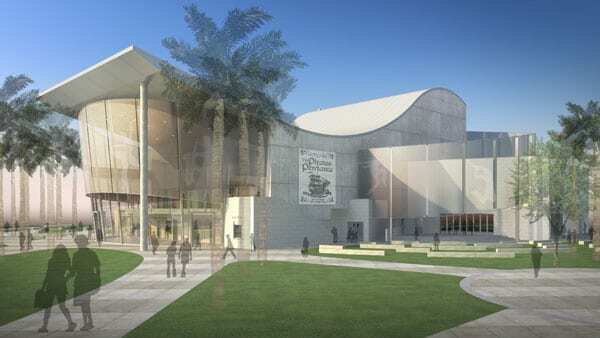 The district, in its documents, said it wanted a center “that nurtures proposed performing arts programs in a manner that meets their functional requirements, is adaptable for future needs, and becomes the defining element for its campus neighborhood and a signature entrance for the school.” And do all that within a $17 million budget. The district advertised for interested firms and then interviewed eight of the 28 that responded. 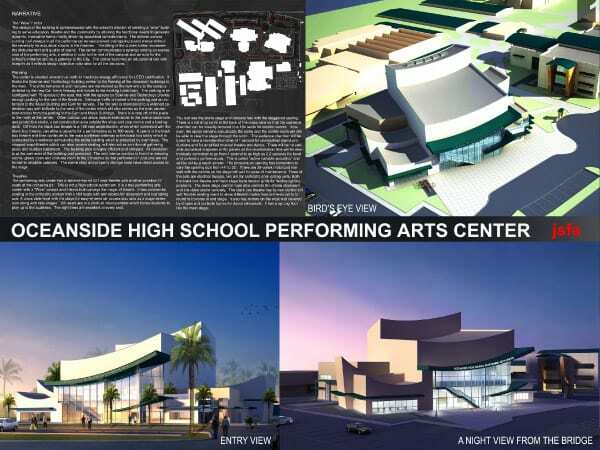 The list was cut late last year to five finalists, the latter having experience in theater and school design. 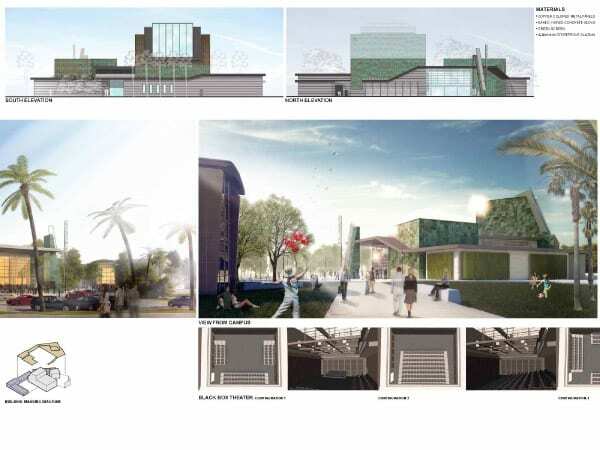 Each received $10,000 for their designs in a process managed by architectural competition advisor Bill Liskamm. Those finalists, all with Southern California offices, were: Baker Nowicki Design Studio; BCA Architects; Harley Ellis Devereaux Architects; John Sergio Fisher and Associates; and Roesling Nakamura Terada Architects. A six-member jury of design professionals, theater experts and school officials was formed to recommend a winner. Then, after a public display, the school board in late February affirmed the jury’s choice of Harley Ellis Devereaux. The Harley Ellis Devereaux proposal has a series of sculptural forms, with a higher boxy portion to accommodate stage apparatus. 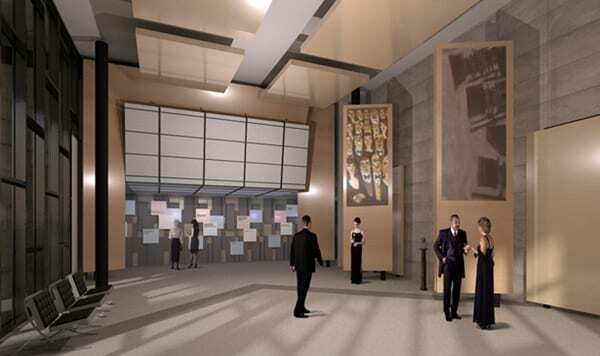 A common lobby links the large auditorium and the smaller performance space and the lobby can serve as a gallery or meeting room, with bands of digital “Times Square-is” announcements crossing the room. A separate obelisk-like tower for the box office is pierced by a roof extension from the main building, which also creates a sheltered walkway and canopy. The complex’s upper exterior is partly clad in copper panels, an unusual choice for a location that gets sea breezes. 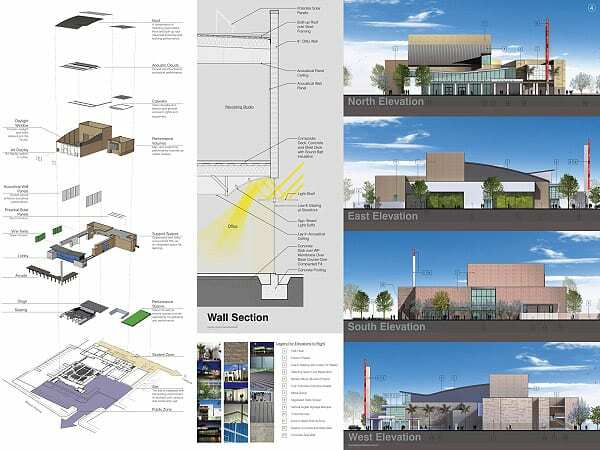 The most eye-grabbing element is a tower-like solar chimney for passive cooling and sunlight collection for electricity on the back of the proscenium. The chimney will be lit up at night with a massive video screen, providing an attraction visible from town and freeway. “It’s a kind of beacon, a very visual evidence of commitment to sustainability,” said Dale. The entry from Roesling Nakamura Terada Architects has a beveled wing-like roof line with skylight elements that bring sunshine into the complex and can be screened off during shows. The concrete block building is fronted by a glowing glass wall and, outside that, a pergola walkway of columns. Off to the side, a slim marquee tower of about 50 feet height can flash digital announcements to the world. 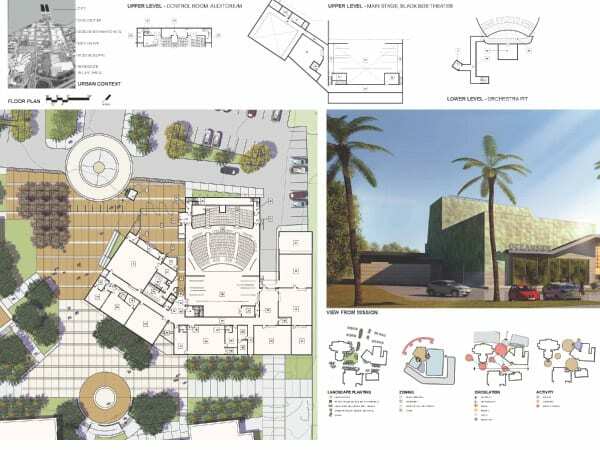 Its two performance spaces are separated by an outdoor plaza, and student-oriented functions are in the back, in a two story wing. The black box can open to a grassy amphitheater. BCA Architects took their inspiration from the nearby ocean and beach, according to firm president Paul Bunton. Its curved, wavy roofs and a mesh screen wrapping the exterior like a ribbon picked up on the sense ocean waves. “That was a key theme,” he said. That sense of movement continued into the main hall, where curved sound baffles on the ceiling and angle walls give the impression of such motion. Much of the Fisher plan evolved from giving the main theater enough ceiling height and room volume to properly project the music of a full orchestra, according to principal John Sergio Fisher. The curved rooflines, inside and out, evoke a sweeping feeling but also help with the sound quality and eliminate the need for an acoustical ceiling cloud. 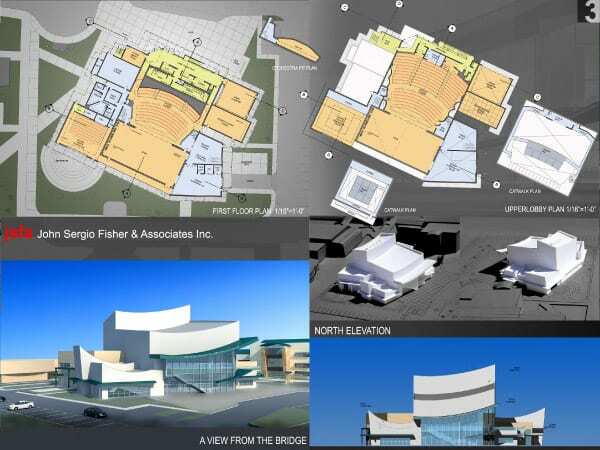 “We were doing a performing arts center, not a high school auditorium,” he explained. 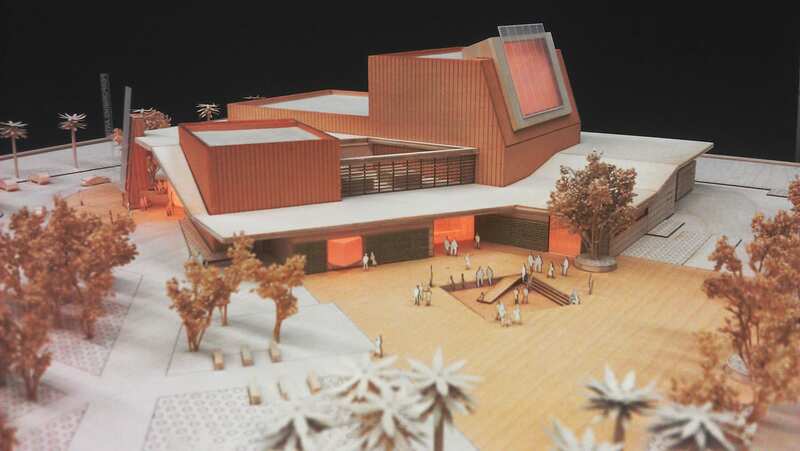 As a result, the building itself is a series of stepped-up massings with slanted rooflines. 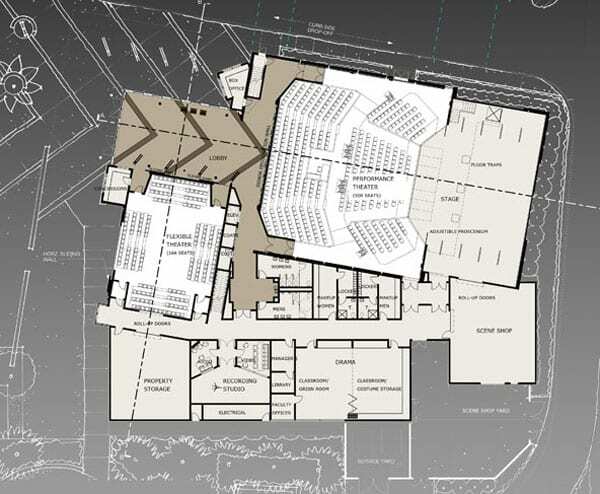 The stage loft, to the rear, is the highest point, and flanks of lower-scaled wings on the sides contain classrooms, sound studios, costume shop and the black box space. That flexible performance space can open up to the outdoors and an amphitheater. 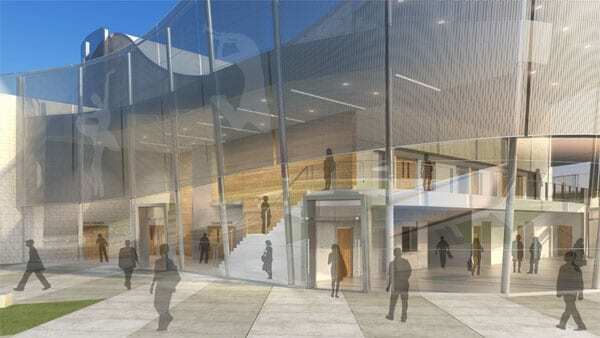 Much of the main structure’s public façade will be a two-story wall of glass and much of the rest would be masonry. The Baker Nowicki design for the main auditorium differed from the other finalists in laying out some distinctly separate side sections of seats, slanted in their orientation, rather than the completely straight or gently curving rows of traditional Continental seating. Baker said the angled sections created “a little more creative atmosphere and changes the experience for patrons.” He also said it makes better use of the space for smaller meetings. In the discussions among jurors and then among school board members, some of the plans were rejected for being overdesigned, too overpowering and not paying attention to the kind of war and tear, and potential vandalism, that can deface a high school facility. 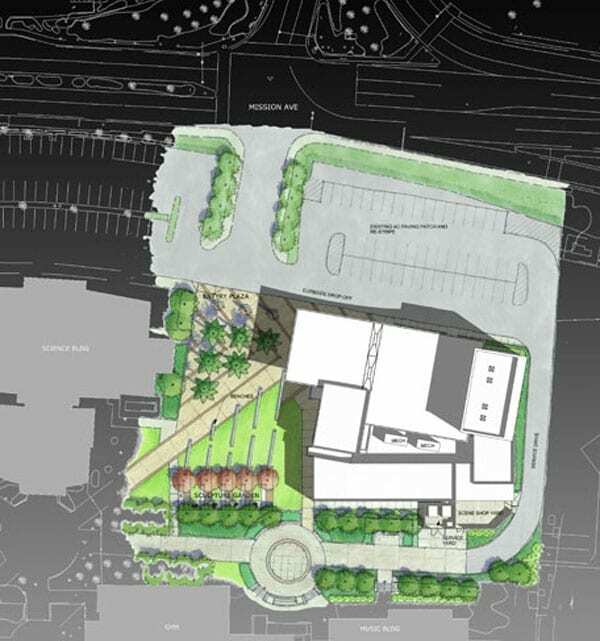 Some of the proposed lobbies were too small, and, according to jurors and officials, some entries did not pay enough attention to the classroom and teaching facilities. 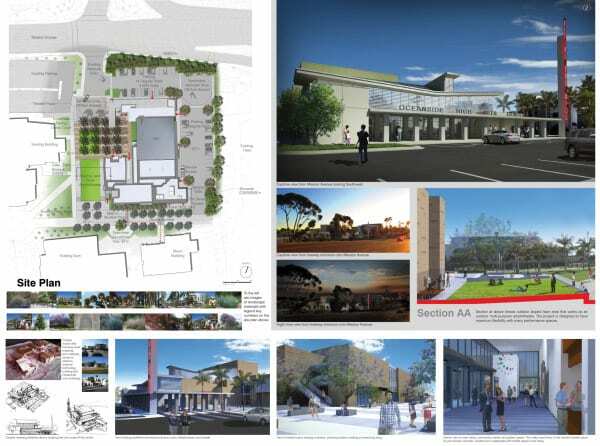 Overall, the plan “was well scaled and fit more comfortably into the site,” recalled juror Eric Davy, a San Diego architect. 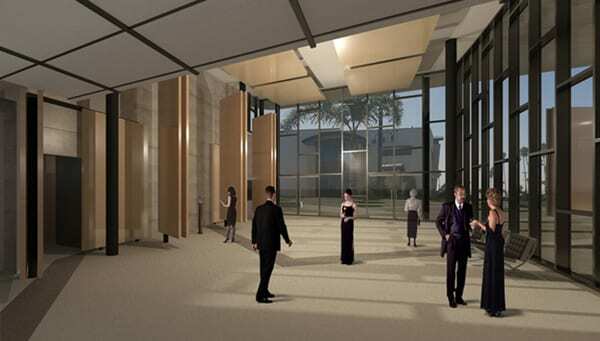 Its interior layout was appealing, particularly the usable lobby that linked the two performance spaces and provided more flexibility for various uses. 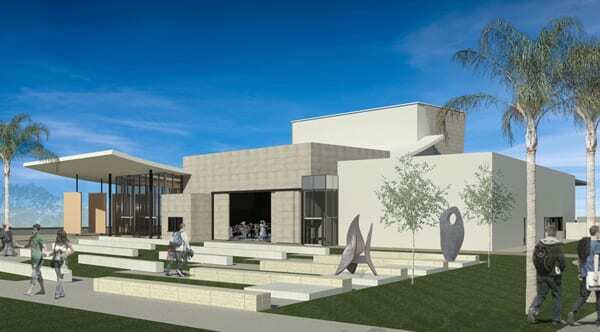 For juror William Virchis, a veteran theater teacher and arts activist in the San Diego region, the winner combined an iconic presence with attention to function and long-term maintenance. 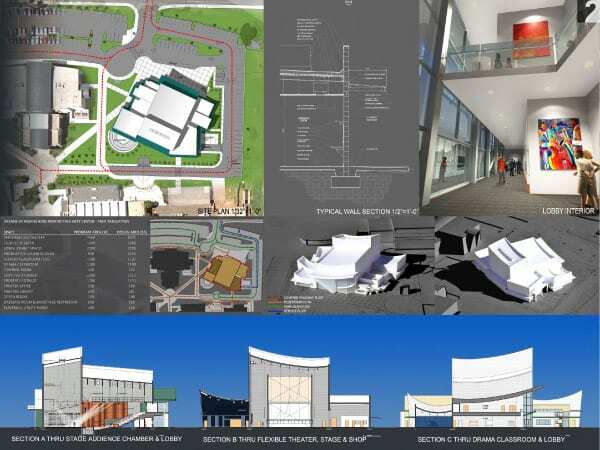 For example, he said the design accommodated theater sets and orchestras while keeping in mind its use for students day to day. “Others didn’t seem very practical for instructional use,” he said. 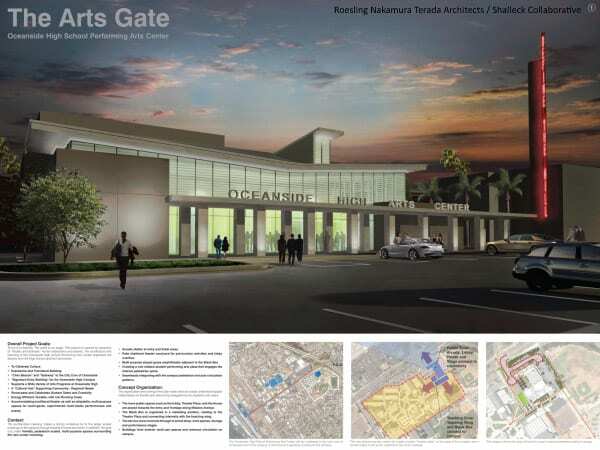 More detailed design work and permitting are now underway, with groundbreaking expected in early 2014. Officials then estimate that construction will take about 18 months. The basic construction costs remain about $17 million but the overall price tag is expected to be about $23.2 million including equipment and costs for inspection and testing.